Seriously? OMG! 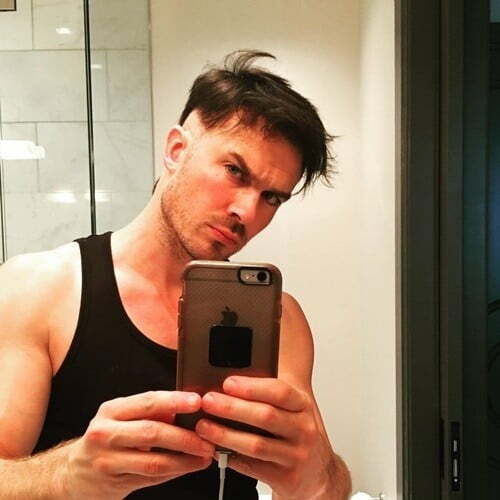 WTF?Ian Somerhalder Archives - Seriously? OMG! WTF? Ian Somerhalder and Nikki Reed have their baby Vampire! Vampires Ian Somerhalder and Nikki Reed welcomed their first child, a girl, on Tuesday, July 25th. According to People, they named her Bodhi Soleil. Not much more is known, but I am sure the new parents, who have been married for two years, will be dreading her 13th year, especially if it turns out to be like the movie that made her famous! Will Ian Somerhalder and Nikki Reed give birth to a Vampire? If two actors who played Vampires in some of Hollywood’s biggest productions on the mythological creature, got married and got pregnant; does that mean the baby will be born one? That is something we are going to find out any day now because The Vampire Diaries’ Ian Somerhalder and Twilight’s Nikki Reed are expecting their first child together after two years of marriage. Hopefully, their baby will have his eyes because they are some of the most beautiful ones I have ever seen. The one thing we do know for sure is that it will be surrounded by love between its parents and all of their animals. Ian Somerhalder is such a tease! I don’t know about you, but when I read Fifty Shades of Grey, I imagined Ian Somerhalder as Christian Grey. Therefore, today when I saw this photo of him reading the book it made all of those unnatural thoughts again. Seriously, how did they not cast him in the role of our lifetime? It’s time for a white wedding on The Vampire Diaries! Tonight it is time for a wedding that has been a series in the making. Remember during the series premiere of The Vampire Diaries, Caroline (Candice King) declared that she and Stefan (Paul Wesley) were going to have a June Wedding? Well 8 seasons later, tonight is the night and you are cordially invited to watch it at 8p on The CW. It is the second to last episode of the beloved show, and Caroline, Stefan and Damon (Ian Somerhalder) want to bring back Katherine once and for all. The only way to get her to come to them is to throw a wedding she would not miss. Caroline and Stefan are ready to say I do and Damon is thrilled to be the party planner. Granted he has more fun throwing a Bachelor Party for his brother and Bachelorette Party for his future sister-in-law. The first party has the two brothers going to the cemetery to get Katherine’s bones. Giving Somerharlder one of his last memorable comedic scenes that is so Damon. Then, after he gets his brother beyond drunk, it is time for Damon to take him home to sleep it off. Once he is put to bed, Damon and Caroline have a touching heart-to-heart that shows he has been redeemed. Now it is time for the wedding. Caroline’s daughters are there to walk her down the aisle, but is it safe for them? Is it safe for any of them? It’s Mystic Falls, so you know the answer. It is not. Several blasts from the past will show up for Stefan and Caroline’s nuptials and not everyone will live long enough to see the big celebration. There will be deaths. Yes, more than one. Plenty of surprises. Lots of raw emotions and closures that are the perfect set up for next week’s series finale. When it comes to the actual wedding, it is one for the television history books. Their big day is seriously so beautiful and romantic, I want to model mine after theirs. Minus all the death and destruction of course. Did he think when he proposed to Caroline at the beginning of the season that they two would actually get married? He never put a stake in it as he revealed, “I did. I know how the show works, in that sense, if we hadn’t gotten married, it would be a real twist. Once they dangled that carrot, we were going to have to get married. What a way to go out, living happily ever after. Or as long as you in the world of The Vampire Diaries.